Native American’s handcrafted their clothing with hides from game, stones and intricate beading. This well-known attire is often worn at Thanksgiving and costume parties, as well as Halloween. 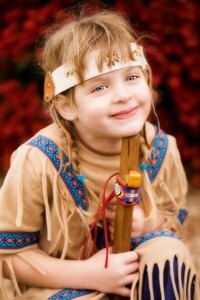 You can craft your own version of a Native American costume with minimal sewing. Accessorize your costume with feathered headpieces, leather belts and moccasins or boots. Lay the shirt flat on your work surface. Make 2-inch clips around the opening of the sleeve to create a fringe. Do this for both sleeves. Pull down on the pieces of fringe gently to stretch them. Cut 4 inches off of the bottom of the shirt. Draw a line that is 4 inches above the hem and cut the shirt along that line while it is lying flat on the work surface. Cut fringe around the bottom of the shirt as you did the sleeves. Snip small slits below the collar, along the curve of the neck on the front of the shirt. Cut two slits 1/4 inch apart from each other, then move 1/2 inch and cut two more slits. Take the portion of fabric that you cut off of the bottom of the shirt. Cut it open so it is no longer a band but one long piece of material. Cut 1/4-inch wide by 6-inch long strips. You will need one for each of the sets of slits on your collar. Gently pull on each strip to stretch it. Thread a strip in the first two slits. Go in from the right slit and pull out from the left slit. Tie in a knot. Do this for all of the strips and slits. Trim the fringe to create a variegated pattern, if you wish. Put on the khaki or brown pants. Pin the outer side of the pant leg to fit close to your leg. Leave room so that you will have enough room to slip them on and off. Do this for both legs. Sew along the row of pins to create a new seam. Cut the excess fabric to the side of the seam to form a fringe down the leg. Lay the shirt flat on your work surface. Cut off the sleeves from the shoulder to the armpit. Do not cut the neck. Cut the bottom third of the shirt off. This will be your skirt. Place the bottom portion of the shirt flat on the work surface. Cut 1/8 inch above the bottom hem of the shirt. Cut it open after you have cut it off so it is now one long strip of fabric. Measure the width of the strip. This is your belt. Slice slits in the skirt 1 inch from the top edge. Make them 1 1/2 inches apart from each other. Make the slits the height of the belt from the step above. Thread the belt through the slits starting at the side seam of the skirt. Tie a knot at both ends of the belt so it does not pull back out of the slits. Tie the belt in a bow or knot to secure the skirt when wearing. Take the sleeves that you removed from the shirt and cut long 1/4-inch strips from the material to create pieces of fringe. Pull each piece to stretch. Measure 1/2 inch from the bottom edge of the skirt and cut two slits 1/4 inches apart from each other, then move 1/2 inch and cut two more slits. Go all of the way around the bottom of the skirt. Thread a strip in the first two slits. Go in from the right slit and pull out the left slit. Tie in a knot. Do this for all of the strips and slits. Take your shirt and fold the backside in half vertically. Measure 3 inches from the neckline and make 3-inch cuts down the back. Space them 1 inch apart from each other. Open the shirt and cut up the middle of the back (across the slits you just cut). Try the shirt on and have someone help you tie the loose ends back together with a knot. This will help contour the shirt to your body. Create a fringe around the bottom of the shirt as you did the bottom of the skirt. Cut sets of double slits below the collar of the shirt and tie pieces of fringe to them. Cut the fringe in a V shape to create some detail on the front of the shirt. If you cannot find a brown or tan T-shirt, dye a white one with brown fabric dye per the instructions on the packaging. Let dry or dry it in the dryer. To omit the need to sew all together, wear a pair of brown hospital scrubs pants instead of making the costume pants. Thread beads to the fringe to accent your costume.